Located among the incredibly dense star fields of Scorpius lies a beautiful little dark nebula; Barnard 252. There appears to exist very little, if any, information about this striking absorbing cloud, and it has no popular name. I think it bears a strong resemblance to a jumping dolphin so I call it The Dolphin Nebula. This interstellar cloud is sufficiently dense to completely block the light from thousands of background stars in the direction towards our galactic centre. There exist many dark patches such as this one and the most famous is without doubt the Horsehead Nebula in Orion. 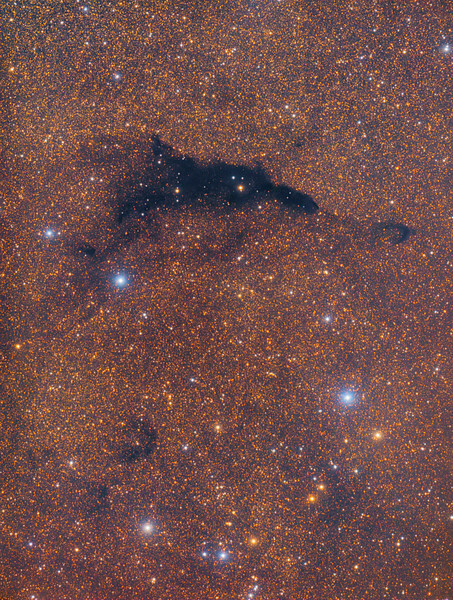 Another and much larger example, visible to the naked eye when away from city lights, is the large dark patch near the Southern Cross known as the Coalsack Nebula. These clouds are full of tiny dust particles, each less than a micrometre in size. Optical wavelengths are easily absorbed by this dust and therefore the nebulae appear dark against any background light. However, radio and infrared wavelengths can penetrate the clouds and allow a peek inside where star formation often occurs. In the early 1900's the american astronomer Edward Emerson Barnard complied a catalogue of dark nebulae by studying his many photographs of the Milky Way. Barnard was also an avid visual observer and discovered 15 comets, Jupiter's small moon Amalthea and Barnards Star the second closest star to our solar system. He also made fleeting observations of so-called 'spokes' in Saturn's rings; a mysterious phenomenon only confirmed much later when the Voyager 1 space probe passed Saturn in 1980.